It was that time of the year when IIM-Ahmedabad students were getting ready for campus placements. They were about to witness the same old methods that most companies use while hiring freshers. Multiple companies visit top campuses for pre-placement talks and sessions to interact and attract students to join their workforce. Recruiters present their powerpoint slides to a roomful of students in business suits and inform them about their work culture, job responsibilities, career prospects and all the other usual boring stuff. We have all been students at some point so we all know what these sessions feel like. As usual, Q&A rounds are arranged where students clarify their doubts and ask further questions to senior managers. Most of the sessions are followed by snacks where students move around and personally interact with the recruiters. The process was boring as it failed to showcase outstanding features of a recruiter through limited traditional means. The retention of information was also low. At the end, students were more likely to go to those recruiters who used innovative and unique methods to present information. Companies that used innovation as a tool, knew that if they want to attract the top talents from premier universities, they will have to do something different in the pre- placement process. With innovation at the heart of their business, P&G marketers braced themselves to stand out during campus placements. With a desire to implement a futuristic, innovative solution, P&G approached WOWSOME. Their initial idea was to let the students experience P&G through a 4-5 minute 360 degree Virtual Reality video and introduce them to the world of P&G. “VR is yesterday,” responded Vishal Reddy, the founder and CEO of WOWSOME “why don’t you explore our suite of Mixed Reality solutions that employ cutting-edge augmented reality and IoT (Internet of Things),’ P&G marketers were instantly hooked. WOWSOME understood P&G’s need to create immersive engagement with the brand and to stand out of the crowd of recruiters in order to attract top talents from premium business schools of India. After understanding the traditional pre-placement process, WOWSOME suggested three end-to-end solutions that had mixed reality at its core. A quizzing game that uses IOT sensors, a mixed reality interactive kiosk, and interactive print were developed by WOWSOME and custom tailored for P&G's needs. 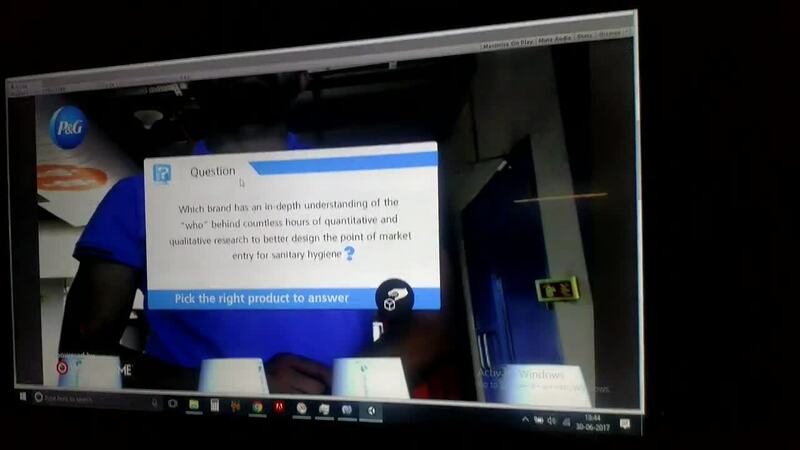 The motive of the quizzing game was to let students engage with P&G products before they decide to apply for a role at P&G. It involves a kiosk where questions are displayed, and an interactive table where some of the P&G products are placed. Questions regarding each of the products were displayed on the screen one by one. To answer a question, users lift the correct product from amongst the ones placed in front of them. The weight sensors placed under each of the products would sense which of the products were picked. Upon picking the correct product, the screen displays the correct answer with accurate description about the product. To continue the game, students would need to place the product back on its place. On picking a wrong product, students would get more chances to answer the question by choosing any of the remaining products. This goes on until five questions are answered about the five products placed on the table. The screen then asks the user to pose for a photo and then a photo is captured automatically. At the end of the quiz, users could view their scores at pg.wowso.me. ‘Is P&G for you?’ - By posing this question to students, P&G wanted to give them an idea about the kind of work environment they provide and decide if P&G is the kind of place they want to work at. Instead of listing down all the incentives an employee would benefit from in a document or a plain PPT, they wanted students to think about all these benefits while considering to apply for a role at P&G. User starts the mixed reality game after registering on the portal online. In the first round, users are asked to rank the qualities they value in a workplace as per their preference. A kinect would detect the movement and gestures of the users. To select one out of the nine options, a candidate would hover the option and hold it. In the second round, the candidate is asked to choose the kind of work environment they would prefer - Friendly, Dynamic, and inclusive. Out of the three options, user selects one using hover and hold method as described earlier. Based on the options chosen, the candidate is also associated with one of these three aquatic animals - shark, whale, and dolphin. Each of the qualities/options are preassigned with one of the animals. The candidate is assigned the animal with which his/her preferred qualities match the most. At the end, a message is displayed, say ‘You’re a Shark with top values:’ followed by the top three qualities chosen by the candidate. The candidate is then prompted to pose for a photo. The link of the photo is then sent to the candidates so they can share it on social media. The last one was interactive print where users scan the given printed brochures through an app to unlock the media content. The media content is aptly augmented on the print brochure, so it can be viewed when the phone is scanned at any angle. (Click here to know how interactive print works.) After the predetermined media plays on their phones, they will be given options to visit the P&G website and social media accounts and given an option to provide their details to show interest in P&G. All the above recruitment solutions were suggested keeping in mind P&G’s motive to engage with the students. WOWSOME also provided them the data to show them how the suggested recruitment solutions were ideal for them. A userflow mapping the details about what a user would do next at each step was also provided to make the solutions easier to comprehend. This helped P&G in deciding to go ahead with the first two of the suggested solutions – P&G Brand Story Kiosk (quiz) and #ISPGFORYOU. During P&G’s pre-placement session at IIM Ahmedabad campus, WOWSOME’s team set up the Interactive Kiosks. The same activations were also arranged at IIM Bangalore and IIM Calcutta. At IIM-A, students lined with excitement to try their hands at the interactive kiosk as they had never interacted with technology at such an intimate level during their campus placement. With such creative recruitment methods that used innovative technology, P&G indeed achieved their goals - to create immersive engagement with students and to stand out of the crowd of recruiters in order to attract top talents from premium business schools of India. With such zeal and strive to be innovative, it was not shocking to see that 100% of the students in the pre-placement process registered and showed interest in applying to P&G. This was a new milestone for WOWSOME as it has set an example in the recruitment industry by introducing cutting edge technology to hire fresh graduates. WOWSOME’s sales team ensures that they reach out to a variety of industries to offer our solutions whereas WOWSOME’s tech team makes sure that they deliver something unique and new every time. No two projects are the same at WOWSOME. With a track record of providing awesome solutions to wow marketers and potential customers, WOWSOME team leaves no stone unturned, be it in any industry. Feel free to get in touch with us to explore similar solutions for your industry!